VR IS A COMPLETELY NEW MEDIUM THAT OFFERS THE POTENTIAL NOT JUST TO CREATE ENTIRELY NEW WAYS FOR PEOPLE TO EXPERIENCE TRADITIONAL ENTERTAINMENT BUT TO EXPERIENCE AND PARTICIPATE IN ENTIRELY NEW FORMS OF CREATION, COMMUNICATION AND INTERACTION. We hold community events and teach courses designed to introduce the art, science and magic of VR design, programming and art. We believe the best education is delivered by zombie teachers, but are realistic in our assessment that zombies do not actually exist, hence we aspire to create the world’s first and only VR zombie education platform in order to realize our dreams, but we need your help. We think we a pretty sweet space for virtual reality development. 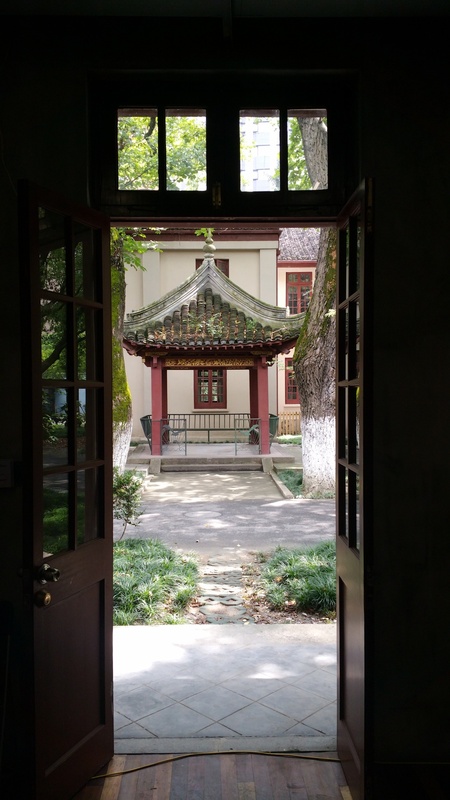 The Transist VR Lab is located on the beautiful campus of Gongyi Xintiandi (previously an orphanage, now a space for social enterprises). The lab is surrounded by open spaces and traditional Chinese buildings dating back to the early 20th century, with bricks used in the construction that are some of the oldest in Shanghai. It’s one of those historic parts of old Shanghai that has so far avoided the gaudy moneyed tentacles of developers. There’s also a legacy of helping those less fortunate: the functionally named Building 4 was originally a Catholic chapel before it was knocked down and transformed into a center for speech therapy. This is the view from outside the lab's door - we have every intention of using our Vive dev kit in the pagoda. We have a ton of open space available for developers to work, as well as showcase their creations to our huge VR enthusiast community. This is the lab's event space. About 300 people have crammed in here before. Our second meetup - there are a lot of people in China interested in VR! The lab is stocked full of state-of-the-art VR hardware, software and accessories. Thanks to our awesome partners (HTC / AMD) we have some of the best VR gear available on the planet. Thanks to AMD, we have some sweet developer workstations. Our goal is to give you the best tech all within arms reach, so you can create VR for all the things. The HTC Vive - it's amazing. Lighthouse basestations on 12ft tripods. What could possibly go wrong? We have DK2s and GearVR (lots of them), beer and some hydras. This is called Project Quantum. Look it up, it's liquid cooled! Mars from AMD brought this to us for the SHVR Jam. It's custom-made. This is our version of the Google cafeteria. Free, home-cooked, awesome Chinese food. There's tons of well-fed stray cats around the lab. This is Ghost, he loves VR.